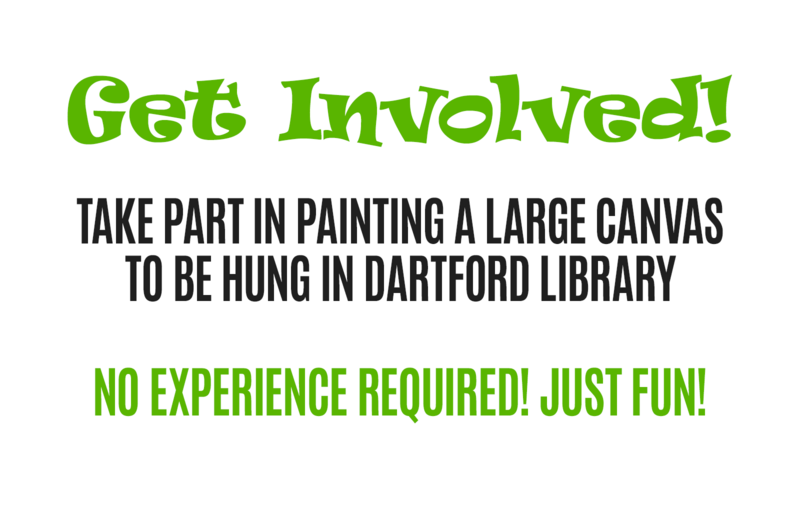 Starting in January 2014, I will be putting together a large art canvas which, when finished, will be installed in the Keyes Room in Dartford Library. The only component that’s missing at the moment is YOU! If you think you cannot draw or paint, NO WORRIES. In fact (and your age does not matter) I would prefer participants to have little or no painting experience. The only requirement is that you live or work in the Dartford area and, if you are under 16, you must be accompanied by a responsible adult. All you have to do is come along to my gallery in Dartford (click here for location map), tell me you’d like to take part, and I’ll book you a square on the canvas. The overall size of the canvas will be approximately 175cm (h) x 280cm (w) (69″ x 110″) and will be divided up into 60 squares, each square will be approximately 30cm x 30cm (12″ x 12″). Once you have registered to take part, I will allocate a square to you and contact you in January 2014 to arrange a date for you to paint your section of this masterpiece in my gallery. The subject of the painting will be the Saturday market in Dartford High Street. I’m aiming to get the artwork finished and installed in Dartford Library by 3 February 2014. It will be unveiled, with as much celebration as possible, on, or around, Saturday, 8 February which is National Libraries Day. Remember, in future years you will be able to take friends and relatives to the Library, point out your ‘square’ and proudly show off your work of art. So don’t delay! Get down to my gallery in the Orchards Shopping Centre in Dartford and register NOW! !